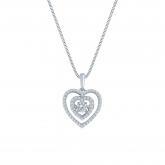 Show her how much your heart beats for her with this elegant 14K white gold heart dancing diamond pendant features a 0.26 ct. center stone. The pendant comes with a matching box type chain that secures with a spring-ring clasp. Total Carat Weight: 0.26 ct. tw. Total Carat Weight: 0.28 ct. tw.